A primary school has defended its decision to introduce unisex toilets for five-to-seven year olds. The new loos at St Nicholas Primary School in Kenilworth, Warwickshire, met with a mixed reaction when announced. Some questioned why separate toilets were replaced, while others accused those complaining of unnecessarily "sexualising" the issue. 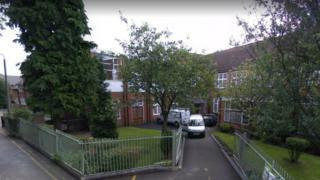 Head teacher Louise Mohacsi said it was a "practical solution to ensure equal access". She said the new Key Stage 1 (KS1) toilets had "individual cubicles with sufficiently high sides to prevent any possibility of peering over into neighbouring cubicles". "Our children have been perfectly happy with the new arrangements," she said. The decision to overhaul the toilets was made as the subsidence-hit Victorian school building underwent extensive construction work over the summer, Ms Mohacsi said. Parents and the public shared a range of responses online. Sue Greaves said: "I wouldn't want to use unisex loos. So why should children have them in schools?" Craig Melvin said: "What was wrong with separate toilets?" However, Lorri Clark said: "Stop assuming KS1 kids have any interest in anything other than going to the loo and spraying each other with tap water when they're in the toilets. "They're kids. Just because adults sexualise everything, don't push it on to them so young!" Parent Rachel Spurgeon said: "It's for KS1 and my kids, who attend there, are perfectly happy with it and see it as completely normal. I agree with them." Ms Mohacsi said the school was "not unique" in its decision, but did not know how many other schools in the area had similar arrangements. In its advice on standards, the Department of Education said schools must ensure "separate toilet facilities for boys and girls aged eight years or over are provided". It said a unisex toilet for older children can be provided in a room intended for use by one pupil at a time which can be locked from inside. Why fit unisex toilets in schools?